The Association is run by an Executive Council led by voluntary Branch Officers. The Executive is comprised of representatives of the branches. The Association’s Officers are elected by the Association members at the Annual General Meeting. All play a vital role in ensuring the Association operates to achieve its main objective - that of WINNING ELECTIONS. All posts are up for election every year, and any member can progress to these positions. The Officer Team has the responsibility to ensure that the Association’s objectives are sustained and steady progress is maintained in all areas. Like any worthwhile organisation there is a lot of hard work to be done. It is rewarding and often good fun. The future of the Conservative Party is very much in the hands of its members. So no matter how little or how much time you can give, it will be well used. Branches: Ash, Brasted, Chevening, Crockham Hill, Dunton Green & Riverhead, Eynsford, Farningham, Horton Kirby & South Darenth, Halstead, Knockholt & Badger's Mount, Hextable, Kemsing, Northern Parishes, Otford & Shoreham, Sevenoaks Kippington, Sevenoaks St John's, Sevenoaks Town, Sevevenoaks Wildernesse & Northern, Sundridge & Ide Hill, Weald Underriver & Seal, Westerham, West Kingsdown. Call the the Association office for the contact information of the Branch Chairman. When you carry out surveys/canvassing in your area in order to gain information about the electorate’s voting intentions, worries and concerns, etc. This information enables us to campaign effectively and helps to increase our membership base. Every year each branch is given a fundraising target, and many members find that their skills can be best utilised by helping to organise the many varied social events that take place throughout the year, thus helping to raise funds as well as bringing enjoyment to everyone involved. Whatever your interests, a local Conservative branch should have some way of utilising them. 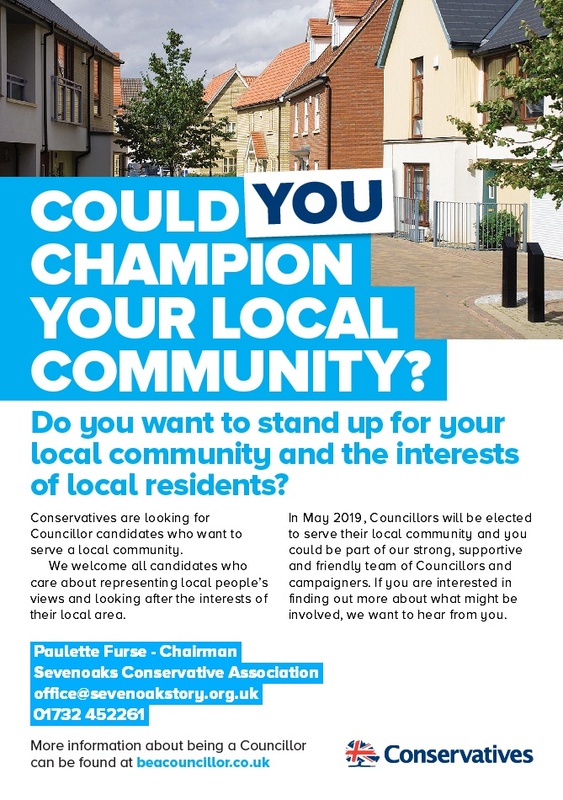 For information about joining Sevenoaks Conservatives please visit the contact us page or download a membership form and post back to us at the address on the form. Alternatively you can join online by clicking on the Join or Renew box on this page. Please click the link below to get involved!